People who do not watch a lot of television may be scratching their head at yesterday’s Golden Globe Television nominations. Asking, where are Modern Family and The Big Bang Theory? Or what are The Affair, Transparent, and The Knick? All good questions, and they can be answered with a simple, the Golden Globes love new shows. On to the most nominated series/films. Fargo led the nominations today with five nominees including Outstanding Miniseries/Movie, and four acting nominations for Martin Freeman, Billy Bob Thornton, Allison Tollman, and Collin Hanks. 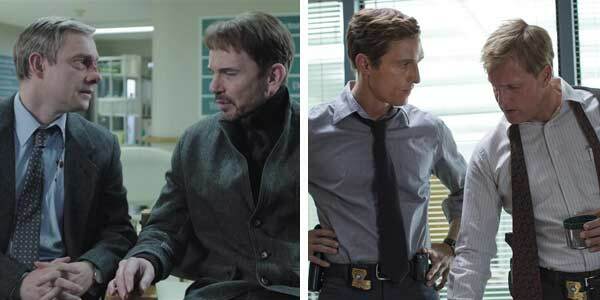 True Detective, which the Globes properly put in the Miniseries/Movie category, had the second most nominations with four. Rounding out the category The Normal Heart received three nominations, including Miniseries/Movie, Mark Ruffalo in Lead Actor, and Matt Bomer in Supporting Actor. Julia Roberts was surprisingly snubbed in Supporting Actress. Rounding out the Miniseries/Movie category is Olive Kitteridge (3 nominations), and always bet on a Starz nomination here now, The Missing (2 nominations). Let’s move on to some of those new shows I talked about earlier on the Drama side, like The Affair, which is in a three-way tie for the most nominations in the Drama category with The Good Wife, and House of Cards. Each has 3 nominations. The Affair is a fantastic new drama on Showtime, and it has the chops to be a winner in one of its three categories. Old favorites Dowton Abbey (2 nominations), and Game of Thrones (1 nomination) round out the Best Drama nominations. Here’s a joke to start out the Best Comedy categories, none of the winners from last year are nominated this year. Oh wait, that’s not funny. Brooklyn Nine-Nine, Andy Samberg, and host Amy Poehler were all snubbed in their perspective categories, which is why I love and question the Globes television nominations. One of the best things about this year’s Globes Comedy/Musical nominees is that four out of the five nominees are created by women, which is a fantastic feat. Three of the show’s star feature a woman as a central character, and the fourth features a transgender woman. Pretty impressive! This would never happen at the Emmy Awards. Orange is the New Black has the most Comedy/Musical nominations with 3, including nominations for Taylor Schilling, and Uzo Aduba. The rest of the shows in this category are Girls (2 nominations), Transparent (2 nominations), Jane the Virgin (2 nominations), and Silicon Valley (1 nomination). While you may find these nominations a bit quirky, I always find their television nominations the most refreshing. So add a new show to your list, and my advice is either The Affair or Jane the Virgin. In fact you should do both, but start with The Affair, then follow it with Jane; she will brighten your day.